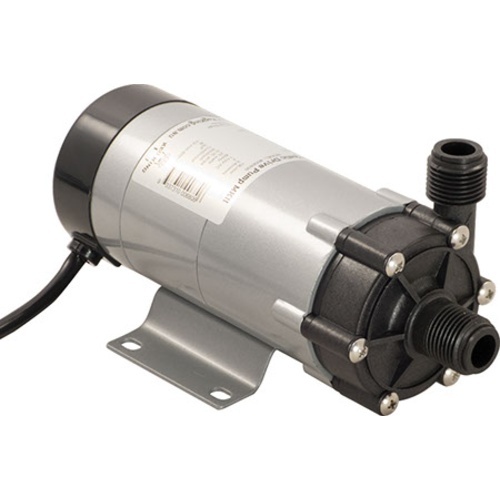 This magnetic drive pump is a perfect pump for your brew system. Use it to move hot wort in an all-grain system and also to transfer wort from boil kettle to fermenter. The housing of the unit is made from tough, food grade polysulfone. 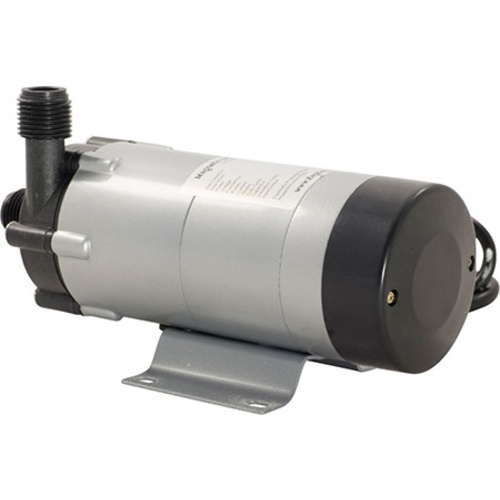 The magnetic drive allows you to slow down the flow without damaging the pump. This pump is not self priming so do not run the pump dry. 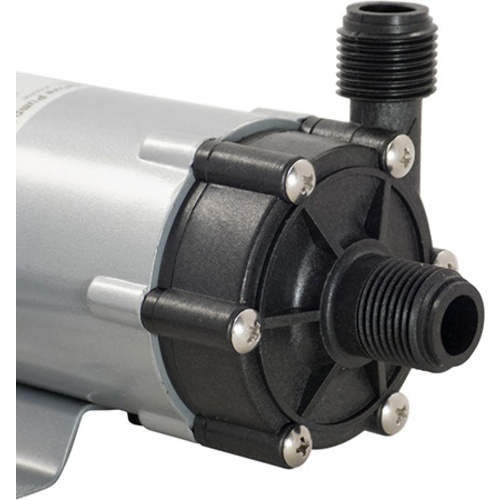 The pump head can be rotated in 60-degree increments, allowing for 6 different pump head orienations. An optional stainless head, PMP501, can also be purchased. Seems right for 5-gal batches and good reviews. Using RYDLYME to backwash my GEO -Thermal furnace. Rydlyme deteriorates the seals on a submersible pump. 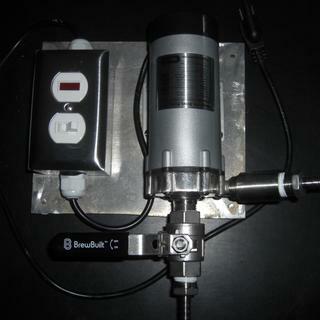 Need magnetic coupled pump. Price. Reviews. Using it for RIMS. 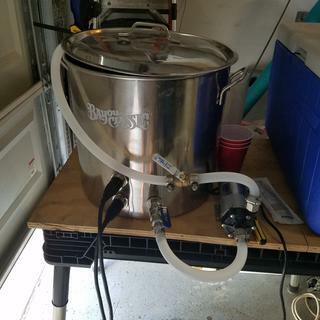 to recirculate water in mash tun when boosting temp. Great price found on Reddit. No more handling of hot water for me! I have one of these pumps already. This will be my second one. They are fantastic! economy and can replace pump head with stainless. Because my other one is AWESOME! Is this powerful enough to whirlpool 5-6 gallons? Just enough to form a trub cone in the center of the wort? It isn’t a self priming pump but once started this will definitely whirlpool your batch. Personally we use a strainer in our boil kettle and a counterflow chiller and the wort comes out at 65-70 degrees from a full boil. Thanks! Enough to separate trub into a cone in the center? Has this pump in 220v? 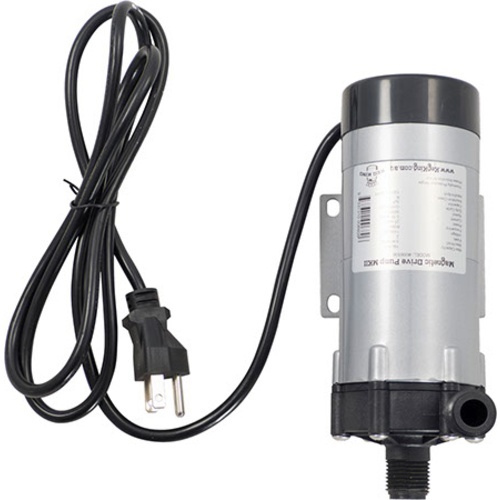 BEST ANSWER: Unfortunately, we only stock the 110v version of this pump. Lucas, this pump is currently available in 110v only in the U.S.. You may be able to contact Keg King in Australia. The pump I have is 120v. Does this pump require I port my kettle? Will it be too difficult to prime without the port? BEST ANSWER: Hello Brad - It is highly recommend to have a bulkhead with shut-off valves on your kettle any time using a pump. The dangers of manually priming and or using a pump around boiling liquids are far too great. Really needs a port. Great pump! 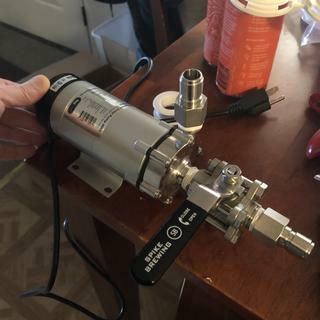 Can I use this pump with oil instead of water or beer? Thank you! BEST ANSWER: I do not see why not but remember this is not a self priming pump. Also, depending on the oil they will be thicker. It’s a very beefy pump so it will push the liquids. The head is a “o” ring and the magnetic drive is powerful as far as pumps go. This pump is amazing! I use it to recirculate mash since now I do full volume mashes and I was getting cold spots. Not anymore!! I boosted my efficiency 20%! I wasn’t expecting much flow but I had to slow it down quite a bit. And it’s super quiet!! I didn’t know it was on until wort started flowing! The Prius of pumps! It would be nice if it came with the SS head as an upgrade option, not a separate item. Now I have a polysulphone head I don’t need. It’s not quite sturdy enough to support my ball valve without tipping forward, which I’m not sure if that is common for pumps as this is my first. If you mounted it this wouldn’t be a problem. Also an on/off switch would be clutch but no worries. Definitely worth the buy. Thank you so much for your detailed feedback. We really appreciate the honesty and value great feedback like this as it helps us improve our products. Cheers! This pump and head has made transfer of wart easy. Mounted on aluminum plate and added switch with incinerator light. The pump runs very quit so the incinerator light is a big help. Always us a GFI Beer and electricity only mix when watching TV. Perfect sparge pump. Use in place of chuggar or march. This would get 5 stars if you didn't need to upgrade the head to the stainless steel model. The plastic head does not thread properly and broke off even with a little bit of torque to put fittings on it. The pump works great and is very quiet. Pump works great, only reason I didn't give it 5 stars is I had to order the upgraded housing, based on other reviews the plastic one breaks easily and I didn't want to risk it. They need the option to just get it with the steel housing instead of swapping it out. I would rate it higher but the manufacturer insists on shipping it with BSP (British) threads, which won't seal properly when used with NTS (North American) fittings, used by the entire North American brewing industry. The fix is simple: Change out the head for one with NTS threads. I contacted the Australian manufacturer and he was clear about not using NTS fittings, as they would leak and damage the threads, but the supplier insists it's OK – just put lots of tape on the threads. Using this for whirlpool & chilling with CFC. Seems more wet resistant than other pumps, but the flow is just barely adequate for me. I would recommend this pump to all who are looking for a great value! Works well and is easy to clean! Works great, everything was delivered on time and packed well! Worked perfectly, very quite, used for recirculation mashed, completely satisfied so far. Ten brews using this pump and it’s working great. The pump itself is fantastic. Very efficient and easy to set up. However, as some of the other reviews have mentioned, the plastic head broke (my fault). I ended up buying the stainless steel head which was out of stock everywhere for several months. My opinion: the pump should come with the stainless steel head. I researched a number of pumps and was very impressed with its features, so I purchased it and the SS pump head. I have a brew tree so I needed to mount it vertically, but when I rotated the head to orientate it vertically, but due to the placement of the 6 bolt holes you can only mount it horizontally if you want the pump outlet to face straight upwards, otherwise in a vertical position the outlet is at about a 15 - 20 degree angle offset from vertical. Since this was in the way of other parts on the tree I had to send it back. But if your gonna mount this horizontally your in luck. Does not self prime. Only proms with gravity fed. He does have very well once it works. Awesome! Just like I hoped it would be. Quiet and powerful! Highly recommend! Short answer: It does not have tons of power, but great for the price. Long answer: Works fine, but when the brew kettle is too low in relation to the plate chiller (in my case) or final vessel, it does not have the power to pump the liquid until the end. Also, not having a switch in the pump makes it a little cumbersome when you are done with pumping liquid. Mounted it to my table, hooked it up to a switch. Pumps fast. Not the most powerful pump, but for the price you can't complain. The pump works as it should but when tried adding on SS quick disconnects the threads shredded the polysulfone and I had to immediately order the SS pump head. I was planning on upgrading at some point but it would have been nice if they sold the pump with the SS pump head, to begin with, so you can choose between the two options. Good value - but buy the stainless head! The pump performs as advertised. 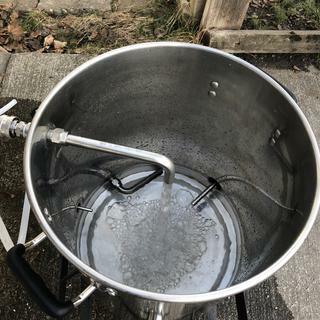 I use it for recirculating my mash, lautering/sparging and whirlpool/transfer on 5 gallon batches. I'm deducting one star only because the outlet on the polysulfone head is pretty fragile, ESPECIALLY if you plan on putting a ball valve on the output to control flow. Preparing to use it the first time, I was threading on my ball valve and over-torqued by hand and snapped it off. I had order the stainless head before brewing with it, which was inconvenient but I'm glad that I did get it. IMO you should just spring for the stainless head upgrade from the start, which is still a great value at about $100 total. I'm not aware of anything else available at that price point.